Today, with the help of Wendy Wright- lactation consultant, mom and founder of 16 Minute Club- I am going to help answer some of those burning questions about making the transition into starting solids! How much breast milk does baby need now that solid's have been introduced? Wendy's answer: Breast milk will continue to be the primary source of protein and calories during baby’s entire first year. Even though you are starting solids, your baby should continue to breastfeed on your normal schedule. Over the next 4 - 5 months, baby may drop one or two feedings as solids increase, especially since you will most likely be mixing solids with breast milk so protein and calories will remain consistent. Formula fed babies should also continue to drink their usual number of bottles per day, dropping one or two bottles over the next 4 -5 months. My thoughts: I like to think of foods before the one year mark as snacks-and just for fun! To make sure that solids are not replacing breast milk as her primary source of nutrition, I always make sure to nurse Finley shortly before mealtime. Generally, that means nursing before I start cooking meals for the rest of the family. Then after I've finished eating myself, she'll finish off with another quick nursing session. I did the same with my son, and he continued to nurse frequently well into the first year and even beyond. I can assure you from my experience that the introductions of real foods may change your breastfeeding relationship, but it will not replace it! How often/when should baby eat? This is very similar to the schedule we use as well. Finley has only been eating solids for a few short weeks, so we've not yet introduced a morning meal, but will in the next few days once a few more foods have been introduced! What should I feed baby first? Wendy was also kind enough to share a great recipe perfect for baby's first foods!! Pre-heat oven to 425 degrees F. Prick sweet potatoes with a small knife and place on a baking sheet. Roast until wrinkled and tender when pierced with the tip of a knife; 45 - 60 minutes. Let cool. Halve sweet potatoes, scoop out flesh from skins, and puree flesh in a food processor until smooth. Add breast milk to thin sweet potatoes to a consistency your baby can handle. As baby gets older and can eat thicker purees, mash some or all of the sweet potato with a fork. To store, refrigerate cooled puree in an airtight container for up to three days, or fill ice-cube trays or other containers to free for up to three months. Personally, we started both kiddos off with avocado, followed by bananas. An important thing to remember when introducing new foods is to space them out and watch for reactions. We introduce a new food a minimum of 3-4 days after the last. The foods mentioned above are generally safe for baby, minimal reactions...but not impossible! As a matter of fact, we discovered that bananas will cause Finley to break out, so they are now a no go for now! Winners will be contacted via e-mail after giveaway ends, and will have 48 hours to respond before a new winner is chosen. One entry per household, winning entry will be verified. Odds of winning depend on valid entries received. A Modern Day Fairy Tale is not responsible for prize delivery. 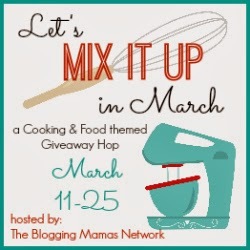 So Easy Being Green, Viva Veltoro, the Blogging Mamas Network, and the Mix It Up in March participating bloggers are not responsible for sponsors who do not fulfill prize obligations.Disclosure: I received the products mentioned above in exchange for my honest review. All thoughts and opinions are 100% my own. I would need the teeth and toys or the starting solids box, my baby is 6 months old now! 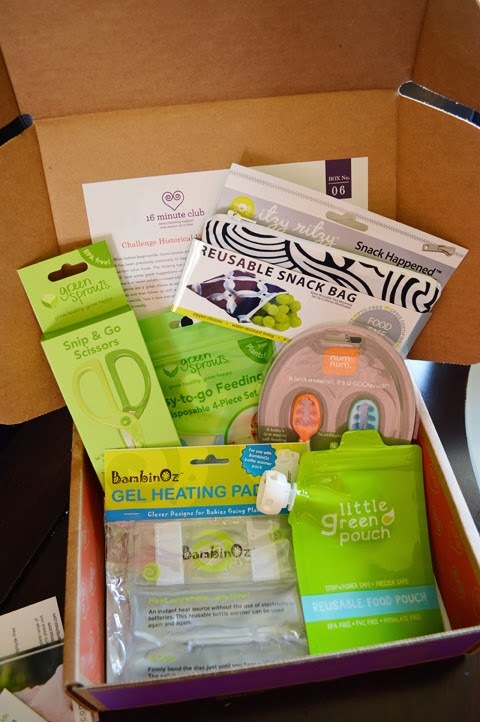 Would love to win the Starting Solids box as my baby boy is now at that point. I'd looove to get a box for our newbie due May 1st! Probably the Growth Spurt or maybe the Teeth & Toys one for when he's a little bit older! Would love to be able to surprise my best friend with this for her 1.5mo old. In The Groove for Weeks 12-16 for my 3 month old little girl! I'd love an "early weeks" box. I like Box 07, the safety box. I would need the Early Weeks box. I always struggle with breastfeeding and baby #3 is due in 4 short weeks! We would need box 7, the safety box. My little one is almost 5 weeks old so any of them would pretty much work, but I would love to get box 6! My nephew would love "To Catch a Thief"
My little princess would need Box No. 07 Safety First! This looks great! !